I am great for your reply of my mail which i send to you, Am glad to know you, But God knows you better and he knows why he has directed me to you at this point of time. Am fine only that the situation of this place is not really encouraging. I sincerely do appreciate the time you spend out to write back to me also i will like to tell you everything about me. I am Miss Cassy Milla from Sudan in African, a m 25years old girl also I am the only daughter of late Mr/Mrs. Jimmy Lemi Milla From South Sudan in Africa. My father Jimmy Lemi Milla was Cassy successful politician and a business man in south Sudan. Moreover, I want to tell you more about myself but it is very painful in my soul to tell you that i am an orphan, because during the Civil War in my country rebel came to our house and kill both my father and mother. Now, i am living without any helper since my parents death, I escaped being killed because i am living in the boarding school. Right now as i am talking to you i am the only person that is alive in my family. Truly, life has been so much difficult to me, I left my country Sudan because is always attacked by rebels, the rebels are killing people every day also rapping young beautiful ladies every where, so, there is very big problem in my country by the rebels. Thanks God that who help me make my way to Senegal where i am living now as a refugee by the help of the Red Cross Society and I do not intend to go back to my country again because it is too risk to my life, I chose to come to Senegal because I came once to Senegal three years ago with my late father when he was coming for business trip in Senegal and both of us visited Senegal. I have my late father's File which contains important documents here with me now, which I will send to you later if you accept to help me to transfer this money to your bank account for me to be free in this suffering which i found myself. However,I have contacted to the Bank through there Email for them to be aware of my fathers death and my plans now is to recover the inheritance to start my new life. But the bank refused because of my refugee statues saying that it is against their bank law to deal business with some one in captivity like refugee. Latter bank Manager advised me to get in touch with a very responsible person who will stand on my behalf as a foreign partner/trustee for them to transfer the money to his/her own bank account, base on what I had started, Please I will like you to stand on my behalf as my trustee so that the bank will transfer the money to your position, once you agree with me, I will send you details on how to move forward on the issues at hand,it is my solemn pleasure to tell you all these secrete, please do not say that I don't know you or you don't know me, our relationship is a divine connection and I pray that God will touch your heart to consider my bad condition despite my inheritance. please when you call tell him that you want to speak with Miss Cassy M illa from Sudan in the female hostel room number 104, he will send for me. and am Awaiting for your positive response. Attached here is my pictures. Please do keep this only to yourself . Thanks for your respond to my request. I appreciate the time you brought out to read my mail. Here in Refugee camp is like one staying inside prison, and i don't want to continue like this any more that is why i am going to give you all information about this deposit with love and trust. once the bank start up the transfer process i will start up too for my arrangement to meet you face to face, my intention is to have a good future, and a good living and continue with my studies why you help me for investment. I believe in my heart that your help to me will bring something good to us, and i assure you that if god will use you to help me out of this situation, i will never forget you in my life, from the first time i wrote you, i know you will not betray me that is why i have trusted you. I have confidence to go ahead with you in this transaction because i have prayed over it and my heart said i should continue with you. Below here is the contact of the bank. A ttach here is the documents that show that the money is in the bank statement of account and death certificate of my late father and my id cad please send all the documents to the bank when writing email to them OK i have introduce you to them. Looking forward to read the response from the bank. God bless you. Please send mail to them today because i have written to them and have introduce you to them as my partner. W hen you get them on line, tell them that you are my partner.You are representing me as the foreign next of kin to the fund of my late father being deposited in there bank with my name as the next of kin, and ask them the possibility of transferring this fund to your position in your account in your country. ACCOUNT NAME IS. . . . . . . . . . . . . . . . . . Dr. Jimmy Lemi Milla. ACCOUNT NAME IS. . . . . . . . . . . . . . . . . . . . Dr. Jimmy Lemi Milla. I WANT POSSIBILITY OF TRANSFERRING IT TO MY POSSESSION BECAUSE I AM HER FOREIGN PARTNER STANDING TO HELP HER FOR A BETTER FUTURE. Expecting to hear from you the response from the bank after you contact them. 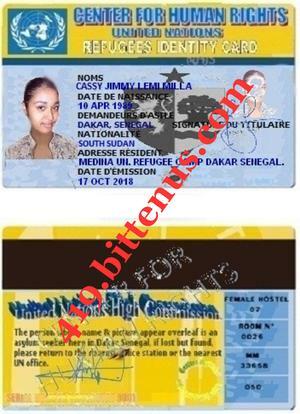 I live in the refugee camp here in Dakar (Senegal), all i want you to do is to help me and transfer my late father money into your account, when the bank will have transferred the money into your account, you willcan take some money from the amount and send to me to come and meet you ok again i will like you to copy this letter and send it to the bank there in London, ok ? in your bank.Miss Cassy Milla in several occasion has communicated with me over E-Mail to assist her receive a funds which har late father deposited with your Bank. I do here by demand that according to advise of Miss Cassy Milla that this bank should grant our request by transferring the said funds into my account in my country. I will appreciate if my request is urgently granted. How are you doing today ? I believe you are doing fine. As for me, i am not very fine since my condition here is not ok but am looking forward to hear from you to know if you have contacted the bank where my inheritance is deposited. Please i need your response in order to know your willingness to assist me move this fund to your possession pending my arrival to join you for an happy life. Please respond to me as soon as possible. Bye for now and have a good day. 36 St Andrew Square EH2 2YB. 1. A power of attorney and affidavit of oath permitting you to claim and transfer the funds to your bank account on her behalf. This document must be prepared and endorsed by a resident lawyer where the girl is staying now and also the girl's signature so that the document will be authentic for the transfer. 2. The death certificate of late DrJimmy Lemi Milla, her deceased father, confirming the death. 3. A copy of statement of account of the account issued to Dr.Jimmy Lemi Millaby our bank. Note that the above are compulsory, and are needed to protect our interest, yours, the next of kin after the claims. These shall also ensure a smooth, quick and successful transfer of the fund is made. We promise to give our customers the best of our services. Should you have any question(s), please contact me, for more directives/clarifications. We are the Royal Bank of Scotland and we are owned by the Royal Bank of Scotland Group plc. We are also known as the data controller. The information you supply will be used for the purpose of providing you with the service you requested. By supplying your address, telephone or email address, you are giving your consent for us to contact you in any of these ways in connection with the request. How are you doing once again? I believe you are still doing fine. the progress am having so far. are waiting for it. His contact information are as follows below. him regarding the two documents power of attorney and affidavit of oath.